Your PC gaming weekend: get a free strategy game, all the E3 news, cosplay as Far Cry 5’s dog, and more! It’s over. And… we’re still alive. Ha! There were a lot of announcements, trailers, and gameplay videos to come out of E3 2017. You’re probably still trying to catch up with everything that happened. But once you’ve done with that, then what? Well, let us tell you what you can get up to this weekend. There was a lot of announcements this week so make sure you’re on top of them with the latest PC games news. 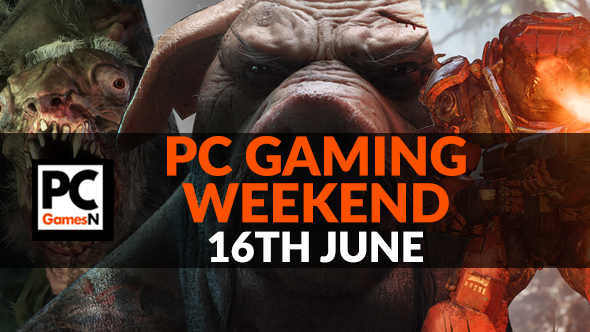 The PC gaming weekend is all about giving you something to do over your two days off. Not just anything, mind you – it’s all PC gaming related. You’ll probably need a rest this weekend after all the excitement of the past week. So sit back in your chair, get comfy, and let’s get cracking – let’s clock up some gaming hours! Get into the open beta of Post Human W.A.R – we have 2000 Steam keys! As always, we have a free game for you to pick up, and this time you don’t even need to enter a competition. We’re giving away 2000 keys to Post Human W.A.R’s open beta on a first come, first served basis. So don’t be slow! As to the game, it’s a turn-based strategy set after humans have been wiped out. You can fight against AI or other players as a sentient vacuum cleaner or a mutated animal. It’s a little odd. Cosplay seems to be getting more and more popular as time goes on. And with popularity has come quality costumes and, at times, absurd ones too. The Far Cry 5 team are embracing that creative spirit by supplying their own cosplay guide for anyone who wants to dress up as the game’s companion dog Boomer. If you do this please send us a photo – we wanna see! The fantastic WW2 strategy game Hearts of Iron IV got a new expansion this week. It’s called Death or Dishonor and lets you play as the smaller forces that were involved in certain battles. We’re talkingHungary, Romania, Czechoslovakia, and Yugoslavia, all of which had it tough, fighting in harsh consditions between Nazi Germany and the Soviet Union. By now you must have heard that Ubisoft re-announced Beyond Good & Evil 2 at E3 this year. It came with a brilliant cinematic trailer that follows a cheeky monkey as it escapes from a dodgy deal into the hectic, sci-fi city around it. But there were secrets in that trailer – secrets that creator Michel Ancel revealed. We’re used to BioWare making single-player RPGs like Dragon Age and Mass Effect. But the studio is going in a slightly different direction, keeping up with the times, and trying to compete with the likes of Destiny with its next game. Called Anthem, it’s a sci-fi MMO shooter in which everyone has Iron Man-like suits. We’re here to tell you everything we know about it so far. Speaking of Destiny, how do you fancy getting a copy of Destiny 2 for free? Well, not entirely free, as you have to first buy a 1080-series graphics card from Nvidia. If you were looking to do that anyway, or think it’s about time for an upgrade, then you might as well get yourself Destiny 2 for free on top of that, right? Tyranny, the RPG in which you work for the most evil thing in the world, didn’t sell as well as its developers wanted. But that doesn’t speak of its quality, nor has it put its developers off from working on it, as they’ve now released an update that adds new stories as well as a New Game Plus mode. Up for more of a challenge? Here you go. Another of the big surprises at E3 this year was the announcement of a third title in the Metro series. This one is called Metro Exodus and it sees the series taking more of a non-linear approach to level design. You’ll be able to head outside of the claustrophobic, dark tunnels of the Russian subway system and into the dangerous wilds of the outside this time around. Just watch out for the bears. If you haven’t played the Quake Champions beta yet then now would be a good time to do that. Why? Well, before it was only available to play at certain times, as designated by id Software. Now, however, it’s open 24/7, so download it and hop right in. Oh, B.J. Blazkowicz from Wolfenstein is in there as a playable character too now. Bethesda want you to watch people play their games. To help that along, they’re giving away free sway to those who either stream themselves playing their games, as well as their audience. This will eventually roll out to many of Bethesda’s games but right now it’s only being applied to The Elder Scrolls: Legends. Get on that.